Spring is around the corner which makes us think of flowers and sunshine. It’s the perfect time to plant your garden and watch the flowers grow but living in the city with a smaller garden does not mean you are left out! For all the city dwellers out there, here are at least 10 reasons why you should create an urban garden in your own space. What is urban gardening? It’s the growing of all types and varieties of plants in an urban environment. Urban gardens include home gardens, community gardens, and school gardens. Here in Cooper-Young, we are fortunate to have all three types. Urban gardens also encompass where you grow your plants. It may be in the ground, with containers, raised beds or window boxes. You may include aquaponic or hydroponic systems and even try rooftop gardening. Of course, urban environments do come with challenges. Tiny yards, too much shade or sun, annoying critters like squirrels and raccoons, contaminated or hardpan soil, and even city ordinances banning front yard vegetable gardens might be deterrents. Fortunately, there are numerous solutions for each. The satisfaction of solving each gardening problem makes the whole experience rewarding as you sculpt your personal space to reflect your interests and needs. Even with the obvious challenges of growing food and flowers in the city, the benefits far outweigh the problems. #2–Urban gardens relieve stress from city noises, congestion, and small spaces. #4–Urban Gardens allow you to grow diverse, healthy food varieties not available locally. Are you convinced? Still not sure urban gardening is for you? 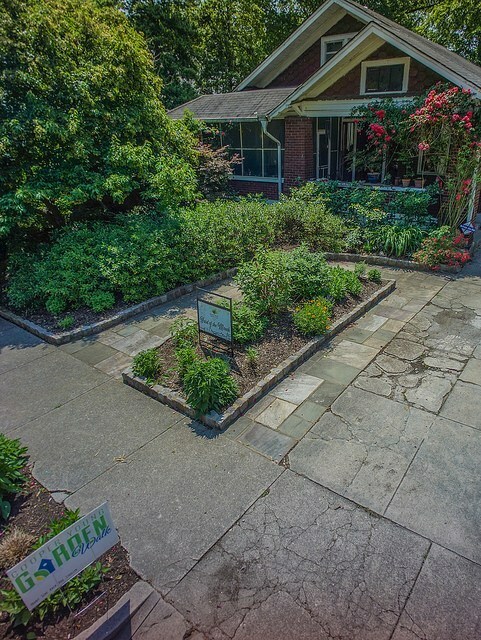 Check out some amazing, functional, relaxing, productive urban gardens on the 4th Annual Cooper-Young Garden Walk to see what urban gardening is all about and get inspiration for your garden. Kim is a Cooper-Young neighbor as well as the creator and organizer of the Cooper-Young Garden Walk which takes place May 18 and 19. Buy your tickets here!